Racing braides Brakes Lines by Wedssport for your car with Swiss homologation documents. 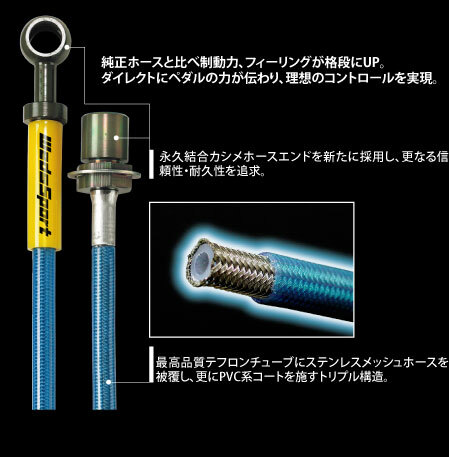 High quality Made in Japan Brake hoses for more than 150 different cars! We also carry a wide range of Clutch line hoses. Wedssport Revline Brake Line Kits are constructed from the finest quality hose, consisting of a PTFE inner and stainless steel overbraid. 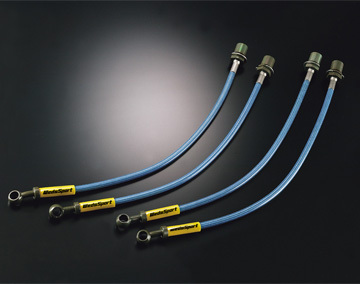 Replacing OE brake lines with -03 PTFE hose improves brake feel over factory lines, eliminates sponginess, and provides shorter stopping distances and consistent braking in performance applications. The shorter stopping distances and improved pedal response provide safety features as well as performance advantages. When used with an ABS braking system they virtually eliminate brake pedal “chatter”. response to the brake caliper. also helps to cool the brake fluid near the caliper.